After crossing the Nullarbor, a trip of some 1600 odd kilometres, we arrived in Ceduna for the next leg of our journey to Penola, where the Solos Rally was being held in 10 days time. Did we take the short way? Of course not, we added another 1600 kilometres to our journey by going via the Eyre Peninsula! It was Friday the 13th the day we arrived! Margaret may live to regret the comment she made about never having bad luck of Black Friday! We stocked up our supplies and went off to the Information Centre to find out what we should do and see in the area. The lady there was really helpful – and a very good salesperson – because we both walked out with a $72 National Parks Pass for 2 months. The first park we were going to was just south of Ceduna on the Eyre Peninsula and was called Decres Bay in the Wittlebee Conservation Park. The road in soon became a gravel road which was very rough and rocky but ok until we got to a sandy patch on a bend where Margaret became firmly stuck in the sand. I tried to dig her out but the weight of her Winnebago just kept burying her deeper and by this stage she was a little stressed, you might say! Three 4×4 utes stopped and one had a winch on it which was finally successful in dragging her out backwards where she promptly reversed all the way to the main road and we headed back to Ceduna and a Caravan Park where a stiff drink was in order. So much for going off road on the Eyre Peninsula – that experience cruelled it for Margaret and she was very wary of any gravel roads after that! We had been recommended to go to the Shelley Beach Caravan Park and that turned out to be a disaster, too. We were allocated a spot right at the end of the park where they were still developing the extensions, so it looked like we were camped in a gravel pit, and the amenities were at least 70 metres away. The owner was very apologetic, told us not only were we on sites that shouldn’t have been let out but also we had been overcharged. To compensate he gave us two stubby coolers each – Big Deal!! I won’t be recommending that park to anyone even though most of the reviews on WikiCamps were very favourable. 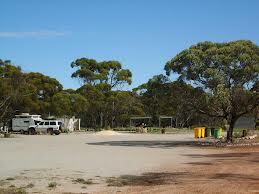 One night was enough here so now we really begin our tour of the Eyre Peninsula. Our first day took in the coastal sights of Smoky Bay, Haslam and Streaky Bay, where we veered off the coast to go to Murphy’s Haystacks on our way to Port Kenny and our eventual camp for the night at Coodlie Park Bush Camp. Coodlie Park was certainly a Bush Camp. It was very basic and judging by the state of the camp kitchen and toilet, not often used or maintained. However, it was a bit of fun seeing what had been developed there and it was a shame it wasn’t better looked after and promoted because it had a lot of potential. It also had a private beach that the owners would take you to (for a cost of $15), but we decided to see the sights for free so one night here and we were on the move again. There was a lot to see the next day as we travelled through Elliston, where there was an historic reference at the jetty about how in the olden days wheat was stacked ready for transporting by ship to the markets. The jetty itself is constucted on steel pylons screwed into the sea bed and is about 430 metres long. From here we passed through Sheringa and stopped off to see an example of drystone walling where the stones are placed in such a way that they don’t need mortar. These particular walls are believed to have been constructed in the 1850’s by convict labour. Not far from here we came across a delightful old cottage called the Lake Hamilton Eating House which used to be a stopover for coach travellers. Now to Coffin Bay, home of the famous Coffin Bay oysters. Wouldn’t you know it, we were there on a Sunday and hardly a place open, so I missed out on those beautiful fresh oysters I was looking forward to. Coffin Bay itself was quite pretty, though, with colourful sails on little boats skimming across the bay. We finally had the chance to use our National Parks Pass near Port Lincoln when we stayed in a camp called Surfleet Cove in the Lincoln National Park. It wasn’t as attractive as some of the National Parks I have stayed in as the camping areas were formed around the ring road that circled the camp rather than being tucked into the bush, but we were entertained by a couple of families of emus that wandered through the camp. The long drop toilets were clean and the beach was quite sheltered but too cold for a swim. After a night at Surfleet Cove we headed into Port Lincoln, famous for its Tuna fishing, although it bills itself as the Seafood Capital of Australia. Commercially, Port Lincoln produces Abalone, Mussels, Oysters, Prawns, Whiting and Snapper,Blue Fin Tuna and Southern Rock Lobster. Pity that most Australians would not be able to afford to buy it! I certainly couldn’t and I was really hanging out for some fresh fish, too. On the positive side Port Lincoln provides overnight camping at Billy Lights Point and Alex Stencross Maritime Museum, which is a great initiative to attract RV’s to their town. 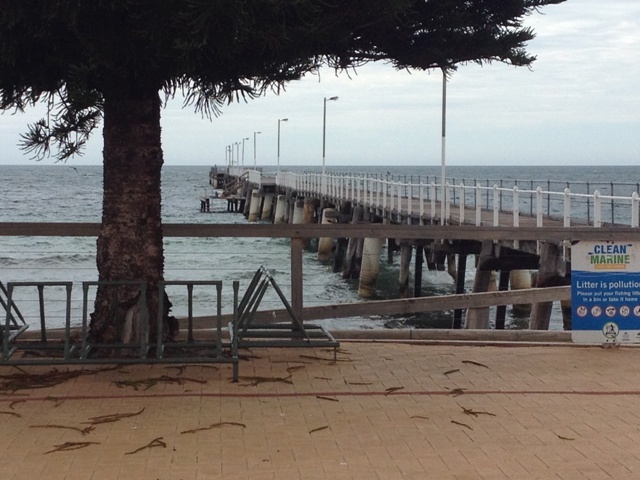 Not far up the road is Tumby Bay, which is another RV friendly town. Margaret and I stopped here for lunch at the jetty and wished we had more time to get to know this pretty area. We thought we might have got our lines out and tried to catch some fish for dinner, but it was so windy we were blown off the foreshore and kept travelling to our next destination. It wasn’t a comfortable day travelling as we had a strong cross wind and Margaret really had to work hard in her larger van to stay on the road. We pulled in to Arno Bay thinking we would stay the night but it didn’t really appeal so we kept going to Cowell, which had a great free RV stop just out of town. The wind didn’t let up all night and the dust swirled so we were glad to be on the road again the next day. We drove into the township on the way out and once again it was a town that appealed to us for a longer stay if we had more time on our hands- lovely old cottages, historic town buildings and a nice foreshore. What is Cowell famous for? The beautiful Cowell Jade! Jade deposits near Cowell on Eyre Peninsula are among the largest known nephrite jade deposits in the world. They were discovered in 1965 when Harry Schiller, a local farmer prospecting in the area, collected a 3–4 kg boulder of dense, hard rock near an outcrop of white, dolomitic marble. The boulder was subsequently identified as nephrite by Adelaide University and South Australian Museum. Ninety-one separate jade outcrops were identified by Department of Mines geologists in 1974, and well over one hundred are now known. 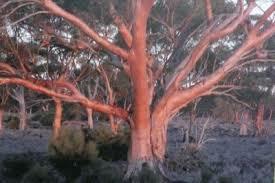 All are located within an area of ~10 km2, referred to as the Cowell Jade Province. 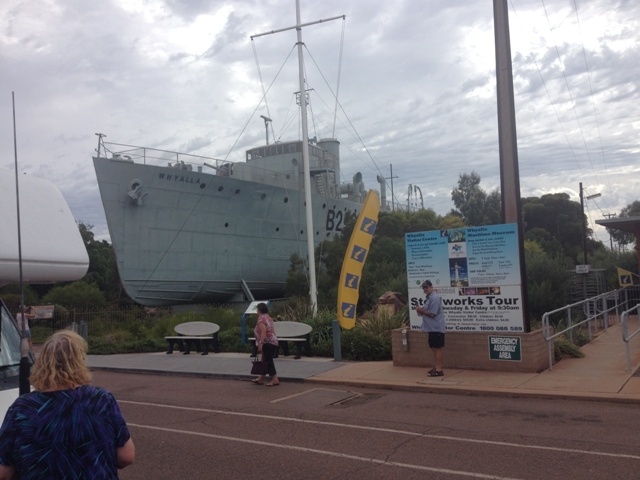 The bulk of resources occur on the 23 leases held by Gemstone Corporation of Australia Ltd.
Whyalla was our next port of call, a brief stop at the information centre and to view the HMAS Whyalla at the Whyalla Maritime Museum. The Whyalla was the first ship built at the Whyalla shipyards in 1941. Driving in to Whyalla we saw these spectacular mine tailings that looked like a many coloured patchwork quilt. Mine tailings, Whyalla. Margaret’s camera is so much better than my iPhone! We arrived at Port Augusta, at the eastern end of the Eyre Peninsula, only four short days after starting our trip at Ceduna. It would be easy to spend weeks rather than days in this beautiful part of our country. Oh well, another place to go on the bucket list to revisit. Next time I’d like to take a deeper breath of Eyre. Categories: Australia, Camping, Travelling | Tags: campervans and motorhomes, camping, Ceduna, coffin Bay, Coodlie Bush Camp, Ellliston, Eyre Peninsula, Murphy's Haystacks, National Parks, Port Lincoln, South Australia, Streaky Bay, Surfleet Cove, Whyalla | Permalink. Around this time last year Lucky Bay was a wonderful introduction to Western Australia so it seems only fitting that my last week or so in WA is back here at Lucky Bay. The camp host, Christopher, was also back here, and Richard, who I had met here, also made the journey from Perth. It was a bit like coming home! And how spectacular it is! I’ve tried to capture the feeling with a new poem called simply, Lucky Bay. It was great having Richard camped nearby as we shared the cooking and ate our meals together – and Lucky Bay is certainly an experience you want to share. One of our neighbours launched Richard’s boat and we headed off on a fishing expedition one day. I wasn’t the champion fisherman this time. Actually neither Richard or I caught anything worth keeping but Rob, our companion, caught a decent size squid. A friend of Richard’s, Jay, came from Esperance to camp for a couple of nights and took us out 4-wheel driving along Rossiters Bay and Dunn’s Beach and then up into the sand dunes. Just spectacular and something I’ve never experienced before. 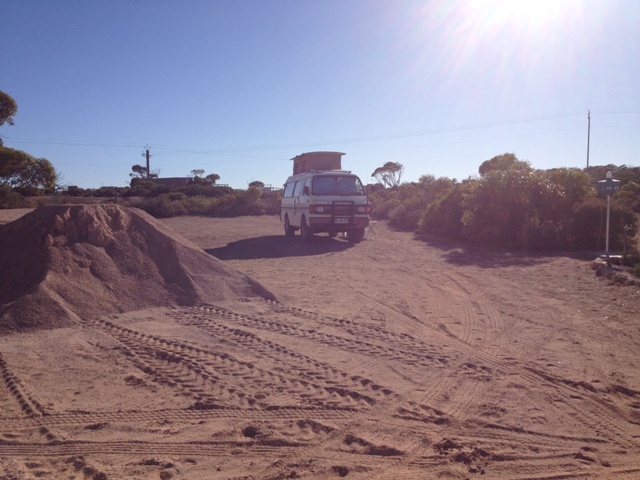 If you have a 4-wheel drive you can drive from Le Grande beach all the way back to Esperance on the beach,too. 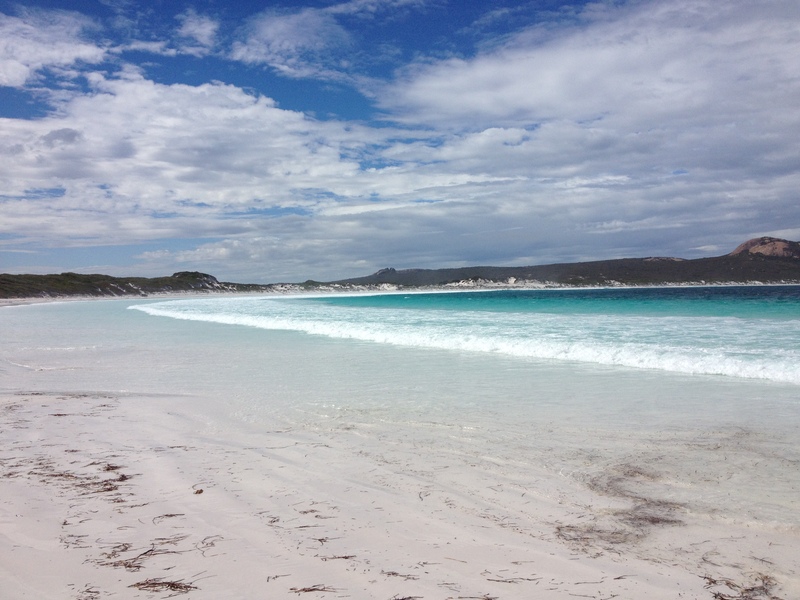 The sand at Lucky Bay and nearby beaches is pure white, and Lucky Bay didn’t disappoint, with the friendly kangaroos lolling on the beach and around the camp sites. One night a kangaroo polished off the remains of some very spicy salad dressing out of my bowl so I think their tastes are very cosmopolitan due to the number of people from all around the world that stop here. 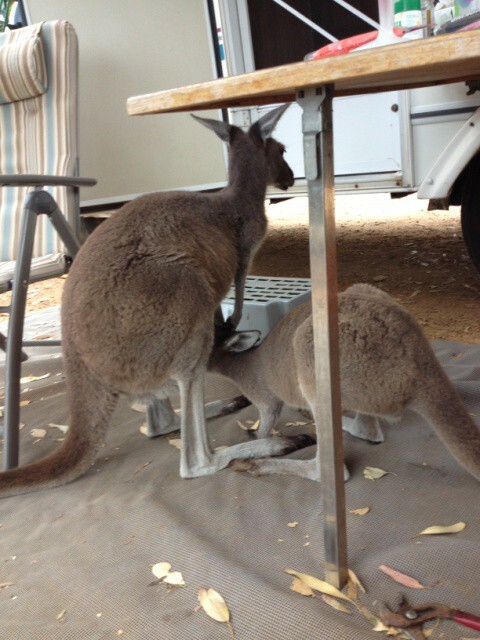 They were obviously comfortable enough to stop and feed the joey one night right under Richard’s table! Richard had the view from his campsite so it was the meeting place for Happy Hour – nothing better than a glass of wine, a spectacular view, acrobatic New Holland Honeyeaters in the trees, and good conversation. Oh dear, does this really have to end? Categories: Australia, Camping, Travelling | Tags: 4-wheel driving, beach camping, beaches, campervans and motorhomes, camping, Cape Le Grande, Dunn's Beach, kangaroos, Lucky Bay, National Parks, Rossiter Bay, sand dunes, travelling, Western Australi, white sand | Permalink. And a python might visit at night. They share with native bees. From the ink blue of the ocean floor. And the squid come up to the light. The sun, the sand and the surf. Is so far out of reach. When you dine with kangaroos. That Lucky Bay is within everyone’s reach. I fell in love with WA. Categories: Australia, Camping, Poetry, Travelling | Tags: Australia, beach, Cape Le Grande, kangaroos, Lucky Bay, National Parks, poetry, Western Australia, white sand | Permalink. After shopping for some supplies in Norseman I decided to head south towards the South-East Coast of Western Australia, with an overnight stop at Salmon Gums. (NO phone, NO internet). 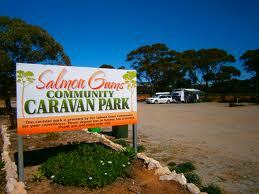 It is named after the beautiful salmon gum trees in the area.This is a small community run caravan park with hot showers, clean amenities, some powered sites and a laundry with washing machine. There was only one van there when I pulled in and no-one around but it wasn’t long before some caravanners, Bob and Carol, arrived. (No Ted and Alice!) It was only $5 for an unpowered site so I did some hand washing, hung it on the line and decided to stay. There were no flies, which was a bonus, but there lots of little bitey ants. The next morning my washing wasn’t dry so I hung around and it wasn’t long before more vans pulled in. We all started chatting and I decided to stay for another night and enjoyed a great Happy Hour with new found friends. John and Helen were one of the other couples and Helen and I started talking blogging. Helen has a travel blog called www.magfowl.com which is really interesting. It was Saturday when I left and headed to Esperance to stock up the cupboards and fill my gas cylinder to keep the fridge running. I shopped first – big mistake! After midday there is no-one that will fill a gas cylinder and the only changeovers available were 9kg and I needed a 4kg one. On the recommendation of a friendly customer in the last servo I went to looking for gas, I headed off the 65kms to a little place called Condingup. Yes, they would fill a gas bottle for me! I’m now on my way to Lucky Bay after a 130km round trip for gas. As I came over the crest of a hill Lucky Bay came into view and I thought, yes, this has been worth the hassle. The beaches along here have been voted the whitest sand beaches in Australia and it’s easy to see why. The pure white sand disappeared in to clear aqua waters, the bays curved towards rocky headlands, the Recherche Archipelago was just off-shore – it was picture postcard perfect. 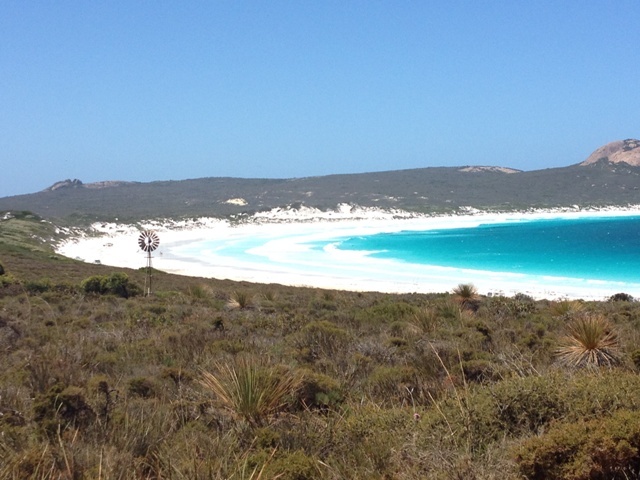 See what the WA Parks people have to say about Lucky Bay in the Cape Le Grand National Park here. There’s also some wonderful photos on this web-site and links to other bays in the area. I enjoyed four beautiful days here for $6.60 per night (plus National Park fees). (NO phone, NO internet).There is a solar shower, a great camp kitchen and believe it or not a coffee van that sets up on the beach most days about 10 o’clock. John and Helen came to visit me while I was there and booked out of their Esperance Caravan Park and camped nearby at Cape Le Grande. My fitness neighbour, Richard, joined me for a walk along the beach one day and we shared Happy Hour that evening before I left the next day. The other beautiful thing about this camp was the birds and I was really excited to see a stunning finch called a Red-eared Firetail. Typically I didn’t get a photo – all the birds I aim the lens at are extremely camera shy, but I found this one on the internet and can guarantee this is exactly what they look like. As I was packing up my camp one of the camp ground kangaroos got upset with me and growled! Did you know they do that? I thought they only made Skippy noises and I got a hell of a fright. Anyhow, a few days later I wrote my first children’s poem called The Angry Kangaroo. I won’t include it here, but you will find it on the Poetry page of my blog. 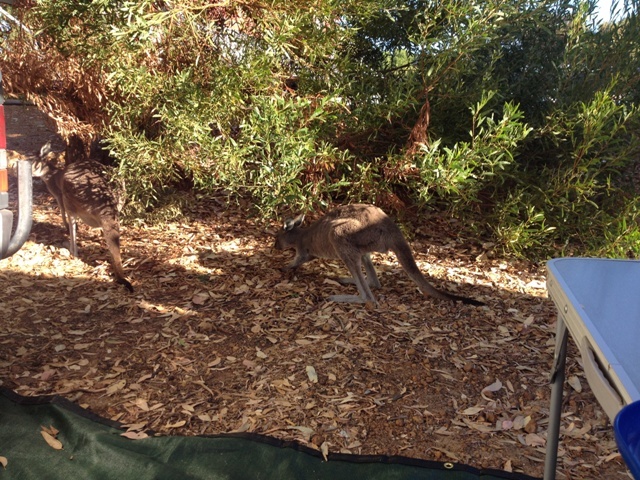 Here are a couple of kangaroos that made themselves at home around the camp. 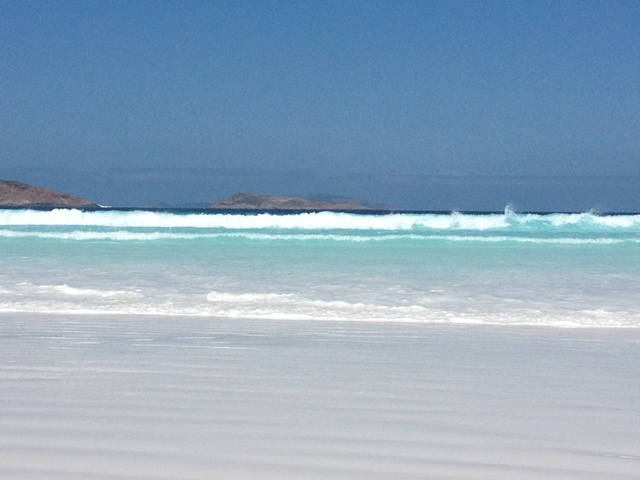 Lucky me – I had spent a wonderful four days in Lucky Bay! 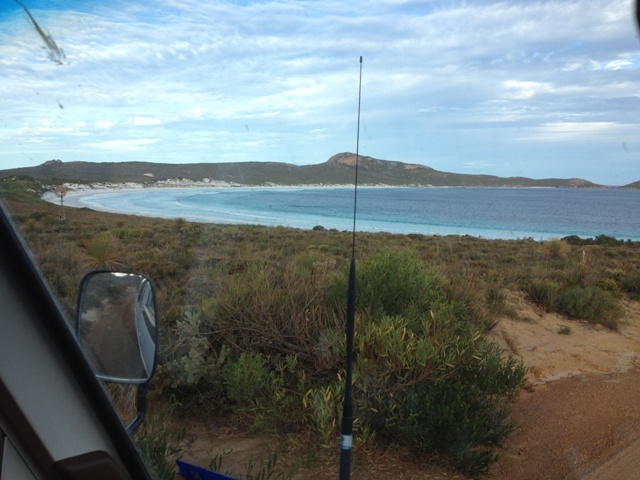 Categories: Camping, Travelling | Tags: beach camping, campervan, camping, Cape Le Grand, Lucky Bay, National Parks, Recherche Archipelago, solo travelling, Western Australia | Permalink.